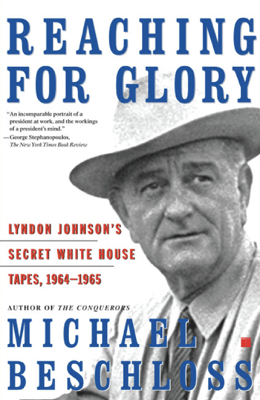 Reaching For Glory by Michael Beschloss is "required reading" (listen to the audio version for an extra bonus as it includes LBJ's own voice) for those who want to better understand the enigmatic life that is Lyndon Johnson. Covering the years 1964-1965, Beschloss gives us the unvarnished and "uninterpreted" voice of Johnson, Lady Bird, and many of his associates. I especially appreciated the Editor's Note (some of Beschloss research methodology), the Cast of Characters (listing key players of the time), and the Appendix (some of Johnon's "ramblings" from 1969 as he reflected on his time in the Oval Office. Unfortunately, the Audible version is abridged only so one who would follow both the written and audible versions will have their work cut out for them. That said, it was worth all the time to follow both, which I did.